The iTunes LP format introduced by Apple last year was the brainchild of record labels looking to increase sales of whole albums, but sales thus far have been soft, a new report alleges. Paul Bonanos with GigaOM wrote Tuesday that industry sources said the iTunes LP format, in its first six months, has sold to enthusiasts, but has failed to catch on with mainstream consumers or to stimulate sales of full-length albums. Originally code-named "Cocktail," the format was designed to reverse a trend toward purchases of single songs by adding bonus content like photos and videos. Sources also told Bonanos that the concept of iTunes LP was not Apple's. Instead, the new format came out of negotiations between the Cupertino, Calif., company and record labels that resulted in the abandonment of restrictive DRM from songs purchased through the iTunes Music Store last year. Apple allegedly agreed to create the new format as a "concession" to the music industry. 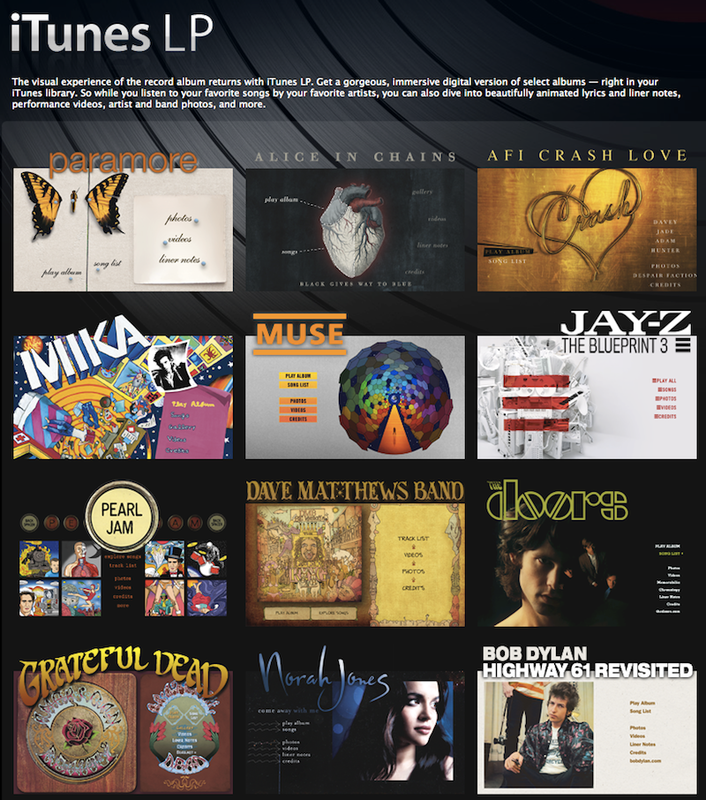 Six months after the iTunes LP format debuted, only 29 albums are available in the interactive format. The reason for so few may be the cost: The first iTunes LP editions released were said to be a $60,000 investment. One source who spoke with Bonanos said that creating the format at that price was not a worthwhile cost. That's not to say content released in the iTunes LP format has lost money. That same source reportedly said that the initial releases proved profitable due to promotion done on Apple's behalf. The costs associated with the fledgling format are likely lower since Apple opened up the developer kit for iTunes LP late last year. The move made it possible for independent artists to release their album in the iTunes LP format. But the market has moved in other directions. "As it turns out, most artists and labels are pursuing a different avenue for their digital goodies: iTunes wildly popular App Store," Bonanos wrote. "Numerous artists have released lyrics, videos and other content in both free and paid apps, which also serve as channels for artist news and can be updated with new content anytime." Apple last December offered users a free taste of the album format with a limited release of its "Holiday Sampler" featuring 20 songs. Support for iTunes LP was expanded last October, when an update to the Apple TV made it possible to play content in the living room. iTunes LPs will also work on the company's forthcoming iPad, which will go on sale April 3.